In language, the parts of speech are the categories of words based on their function within a sentence. This is true with English, as well as with any number of other languages like French and Spanish. This is a helpful way to look at words to help you understand the underlying grammar and logic of any language you study. In English, there are eight different parts of speech. In each of the example sentences below, the highlighted part of speech is in bold. 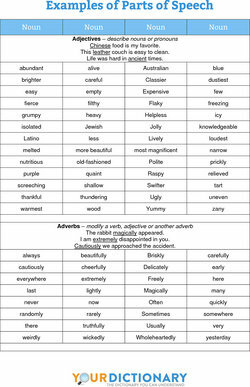 Adjectives modify or describe a noun. These words ascribe an attribute to the noun being modified. The sleepy bear hibernated all winter. It's a long drive, but it's worth the trip. Should I buy the blue jeans or purple sweater? Adverbs modify or describe a verb, adjective or another adverb or word group. This modification can provide information relating to time, place, manner, cause, degree, or circumstance. Joe grumpily got out of bed. Sara ran very quickly to school. That's quite expensive, don't you think? Conjunctions are used connect words, phrases and clauses together. They coordinate the words together so they make sense as a cohesive thought, sentence or paragraph. You'll need to study all night if you want to pass tomorrow's test. Go to the store and buy some milk. Kristopher doesn't have enough experience. Therefore, we will not hire him. Interjections are words used as exclamations to show feelings. They're usually abrupt, interrupting the speech for emotional effect. Bah, who cares what they think anyway? If Cody asked me out on a date, gosh, that'd make my day. I spilled the coffee everywhere. Oops! Nouns name a person, place, thing idea or quality. They can act as the subject or the object of a sentence. Brazil is beautiful this time of year. His love of music really shows. Prepositions are used to indicate relationships, often spatial, between nouns and pronouns. They indicate how one noun, noun phrase, or pronoun relates to another. Between you and me, I wouldn't trust Andy. The coffee shop is across the street. Put the carrots in the refrigerator, please. Pronouns take the place of nouns to simplify speech and writing. They can otherwise function in the same way as nouns, serving as subjects and objects in sentences. She is the smartest kid in class. George took the book from him. Who is coming to the party tonight? Verbs express action or a state of being. It is because of the former that verbs are often called "action verbs," but non-action verbs can be used to represent a state of being, need, sense or preference. The air conditioning unit desperately needs repair. 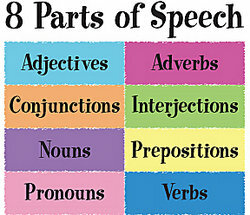 The following chart describes each of the parts of speech and gives everyday examples. This should help provide a better understanding of how each part of speech works. Knowing the different parts of speech and reviewing examples of each can help you improve your grammar. This, in turn, can help you become a more confident speaker and writer. "Parts of Speech Examples." YourDictionary, n.d. Web. 18 April 2019. <https://examples.yourdictionary.com/part-of-speech-examples.html>.